If you’ve been keeping up with pre-order games on the app store, you’ve probably already played Nintendo’s latest offering, Dragalia Lost(Free). For those of you without your fingers hovering over the refresh button awaiting new apps to precipitate into our waiting hands, Nintendo’s first non-franchise iOS game only takes a few chances and adheres to proven formulas. It seems like a general air of generosity between their Super Mario Run(Free) and Fire Emblem Heroes(Free) is being eroded by the immutable economy of iOS. Does this mean that Dragalia Lost is unfair or greedy? I’m certain that there will be those who will unwaveringly believe so, but maybe there are some mitigating factors that are easy to overlook. We’ll dig into these and more details in this closer look of Nintendo’s very first action/social RPG hybrid. Dragalia Lost is a Social RPG with primarily ARPG style gameplay. Unpacking what this means requires a little bit of backtracking for some of our readers, but you folks are with me right? A social RPG is a free to play game with a certain style of interface, item and character aquisition. There is almost always a combination of daily quests, energy systems, with loot and character rolling in a gacha style system of star ranked rarity and power. Login bonuses and Some form of cooperative friend system are also present in most. What all this means is that Dragalia Lost is a Nintendo game but is not a console style game. If you are expecting a console experience, you may be disappointed. 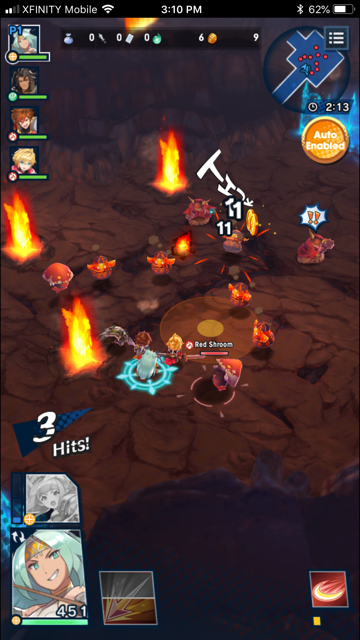 If you are familiar with mobile games such as Puzzle and Dragon, you’re on the right trail, Add in a combat system simliar to Battleheart 2($3.99) and you’re getting even warmer. 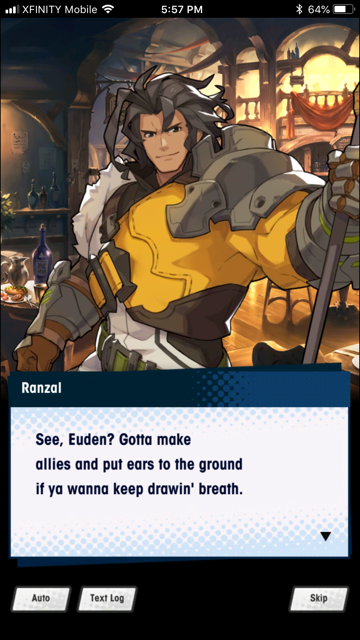 Dragalia Lost follows the path of a young prince named Euden and the adventurers he befriends along his way. Normally a social RPG has a quite forgettable story and dull characters. One of the stronger bits of this game is that most story peices hold humor and solid translation work. You get paid in the game’s valuable in game currency, wyrmite, for reading each story bit that gets unlocked but even without that incentive, the vast majority are a worthwhile time investment of their own filling out the game’s universe and generally being enjoyable. Even the characters you dont put on the front lines fit into the overall narrative and help the game’s universe feel more three dimensional. Once you get into the actual gameplay bits of the game, you’ll find the Battleheart-like action that is a big time pull in. Dodging, queuing up big attacks and oh, did I forget to mention that any character in the game can turn into a dragon to unleash huge explosive attacks that slice right through enemy health bars like a hot knife through butter. Controls are simpler as you only ever control a single character at a time and abilities are on a relatively long cooldown. There is little reason to be furiously tapping out multiple skills like you would in some games like this. The pacing is designed to keep your attention on dodging enemy attacks and occasionally returning the favor once your skills are off cooldown. So what is it about this game that some might think they are getting the short end of the stick? Is it because Nintendo’s previous games were a little overly generous? Is it because social RPGs have an elongated reward cycle? Is it because Nintendo is a brand that is almost synonymous with full priced console gaming experiences? Well, Fire Emblem Heroes does have a higher than normal gacha rate and many in game events. Super Mario Run is a free runner that only restricts some gameplay behind a paywall. What really is happening is that I think Nintendo is getting better at honing their rewards systems to better match the current iOS marketplace. Now whether this is a good thing or a bad thing is highly subject to opinion, but I find it a comfort that they are showing signs be being able to acclimate to a foreign economy and make adjustments. Fire Emblem showed similar adjustments and is financially better off than Super Mario Run. I think this trend has the capacity to continue on through Dragalia and future Nintendo releases.